Ready to run a killer social media campaign? 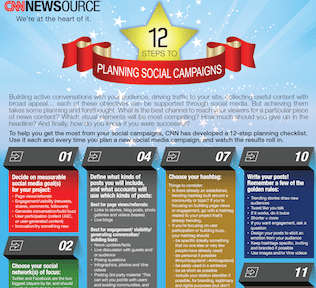 CNN Newsource has developed a 12-step planning checklist to help your social team do just that. Practical and chockful of useful tips, this list was compiled from CNN’s own successful experiences with numerous social media campaigns to engage our viewers and readers. Use this each and every time you plan a new social media campaign, and watch the results roll in.